Last Saturday I was at the Church of England’s General Synod in York. At 3pm, I found myself sitting in a large theatre watching football on a large screen with about 150 people, including a number of bishops and two archbishops! It was, of course, England’s quarter-final in the World Cup. What I found interesting was the way in which we ‘became’ a football crowd, clapping and cheering together as good saves were made, or a player was substituted, or (thankfully) when goals were scored. Although we were essentially watching a TV we, by being together, acted in a different way to perhaps how we would have been on a sofa at home. In an age where we can watch events at a time we choose, on a device that suits us, that sense of coming together and sharing an experience together is something special. That’s true not just of watching TV and following football, but also of the way we live our lives. There are not many opportunities to come together, enjoy one another’s company and share an experience together. community and a common life. This coming weekend, we may be less inclined to watch the World Cup Final given that England aren’t involved. But there are a number of other opportunities for us to come together. On Saturday we’ll be celebrating the 100th anniversary of the birth of Nelson Mandela with the local African Women’s Group in our churchyard. Then on Sunday, we’ll gather at 10am in the church for our weekly Sunday Service and then in the afternoon there will be music in the churchyard – a brass band, choir and wind ensemble – as well as a strawberry tea and a chance to climb the tower. and enjoy views of the city. We will finish before 4pm in case you still want to watch the football. So why not come along and enjoy that sense of community once more? 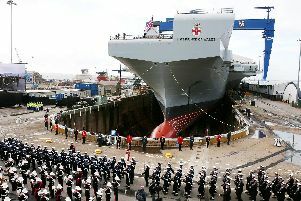 HMS Prince of Wales: What does it mean if Royal Navy Queen Elizabeth-class carrier is mothballed by Government?